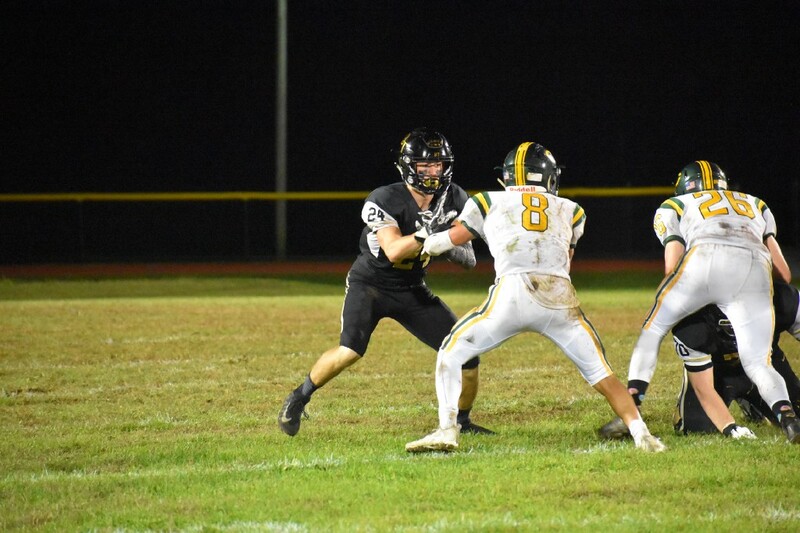 Pae scored four touchdowns in the first half of Burlington Township’s 50–20 win over Clearview on Friday, but catching touchdowns is only a small part of Pae’s game. Isaiah Pae (24) celebrates with Justin Johnson (20) after scoring Pae scored his third touchdown of the game on Friday. 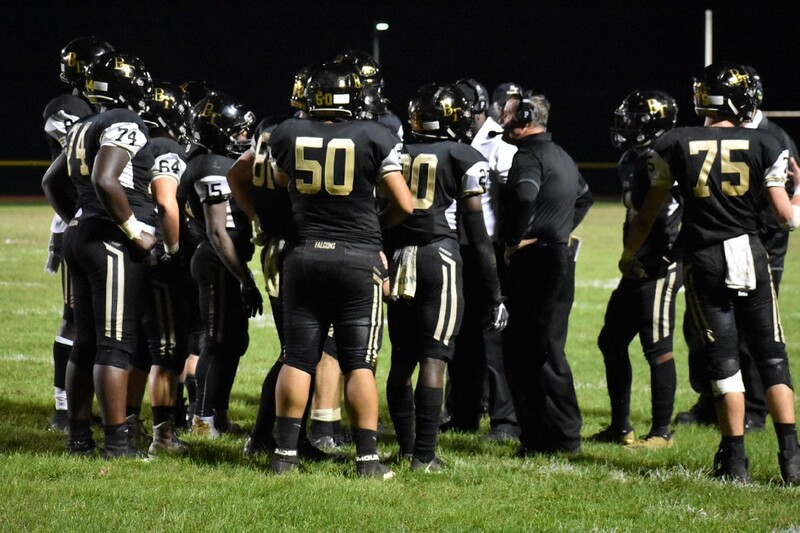 Burlington Township High School football head coach Tom Maderia knows his offense is capable of putting up plenty of touchdowns every game. What he doesn’t know is which player is going to be the go-to scorer. “You don’t know, week-to-week, who’s going to come up with the big games,” Maderia said. The Falcons’ 50–20 win over Clearview Regional High School was senior wide receiver Isaiah Pae’s chance to shine. Pae had a career game, catching four touchdowns in the first half. Those four touchdowns were more than Pae had scored his entire junior season and increased his total in 2018 to a team-best seven touchdown receptions. When asked if he had ever scored four touchdowns in one half, Pae said he hadn’t come close. “I haven’t even scored four touchdowns in one game before,” he said with a laugh. It’s hard to miss Pae when he’s on the football field. Listed on the Falcons’ roster as six-feet, four-inches tall, Pae is one of the tallest receivers on the team and uses his height to his advantage, especially in the red zone. “When we get into the red zone, I’m just a big target, so my quarterback knows that obviously,” Pae added. Pae may have been lighting up the scoreboard for the Falcons on Friday night, but Maderia believes his biggest improvement this year can’t be found on the stat sheet. Isaiah Pae throws a block on a run play for Burlington Township. The Falcons have moved Pae around their formations this season and he has lined up at the tight end position to block. Pae credits his improved blocking to putting in time in the weight room and working his game in practice. Pae has been able to improve his strength off the field as well. Pae described his bond with quarterback Danny Grozozski, wide receivers Tyrese Ware and Justin Johnson and his other teammates as being very tight. 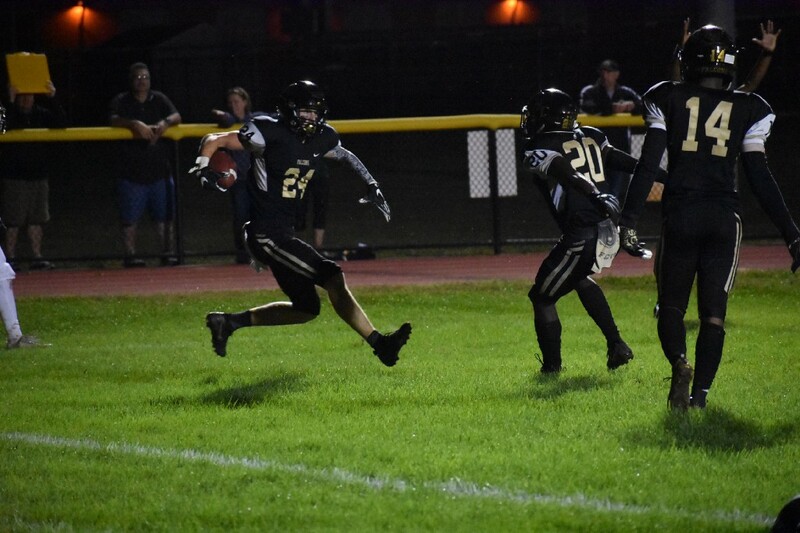 Much of the Falcons’ core came up together through the youth program and have Burlington Township flying high with a perfect 5–0 record this season. Friday night was Burlington Township’s best offensive performance of the season. The team tallied 50 points for the first time all year and scored 40 or more points in a game for the third time. Pae feels there’s two keys to the Falcons’ success heading into mid-October. Head coach Tom Madeira talks to the offense during a timeout. A celebration took place along the Falcons’ sideline as the final seconds ticked off the clock on Friday. Burlington Township’s win was the 100th for Maderia in his 16 seasons with the football program at Burlington Township. Maderia was given a Gatorade bath from his team in the final seconds as a loud roar came up from the sidelines and stands. Pae said the decision to give Maderia a Gatorade bath was spontaneous and happened in the final minutes. “All of the defensive players, they got the jug on him and it was awesome,” Pae said. “It’s a big accomplishment for Coach Maderia and the team,” he added. When asked how he felt following the 100th win, Maderia didn’t focus on himself, but rather the program at Burlington Township. In Maderia’s previous 15 seasons, the Falcons have had just one losing season. “That belongs to every coach and every player that’s been with me the past 16 years,” Maderia said of the milestone. “I’m part of it and I’m happy to be part of it, but it’s a nice feeling for all of us,” he added. Maderia has a career record of 100–60 at Burlington Township. He has 190 wins total in his career, having previously compiled a record of 90–28 as head coach of Holy Cross.